Making its debut this week is the Now Counsel Network, a service that matches solo and small-firm attorneys with experienced freelance lawyers who can provide help on a temporary or project basis. Staffing is a perennial concern for solos and small law firms. For growing firms, hiring an associate at any level can be a time-consuming, hit-or-miss proposition. Other firms may be hesitant to hire a permanent associate because they’re unsure about whether a recent increase in business will last. Some firms may simply need to maintain their current caseload in the face of complications presented by planned or unexpected attorney absences. And, for true solos with no employees, hiring an associate represents a huge (and not necessarily welcome) step into the world of being an employer. All of NCN’s freelance lawyers have at least seven years of experience in practice or in teaching legal writing at a law school, Solomon says. Before approving freelancers to join the network, NCN confirms their bar registration and disciplinary status, reviews a writing sample and checks three references. As of its launch, NCN has freelance lawyers available who can provide support in all aspects of litigation. In the future, it will add support for transactional practices. A firm that wants to hire a freelance lawyer provides NCN with basic information about the project or engagement. NCN then matches the firm with the NCN freelancer who best fits the engagement. Alternatively, the firm can browse NCN’s freelancer profiles and request someone specifically through NCN. The freelancer then contacts the hiring firm to discuss the engagement in more detail and enter into a services agreement. Billing for the freelancer’s work is handled through NCN’s billing platform. However, Solomon says NCN does not have access to the “services performed” section of its freelancers’ invoices, maintaining the confidentiality of information contained in the invoices. For the freelancers, NCN handles marketing and administrative tasks (including credit card and ACH payment processing). NCN freelance lawyers also get access to Freelance Freedom,  a collection of ethics opinions from across the country relevant to freelance lawyering, and a sample services agreement they can use. 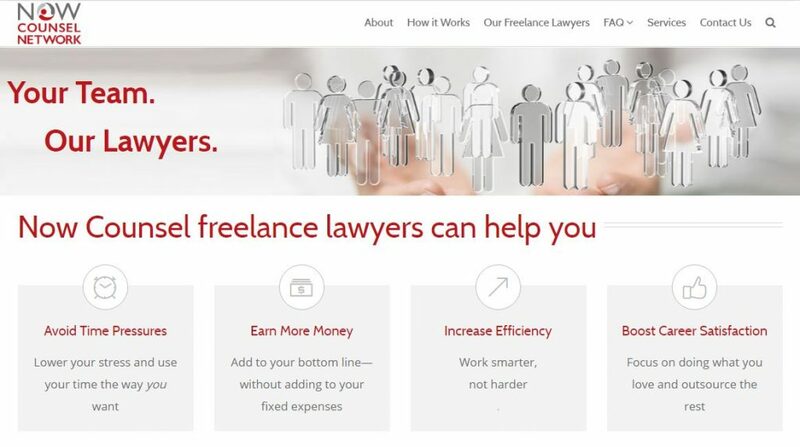 NCN does not charge hiring firms a fee to match them with its freelance lawyer members. Instead, freelancers pay NCN a fee based on the marketing and administrative services NCN provides them. However, if a hiring firm offers full-time employment to a freelancer it found through NCN within 18 months after completion of the engagement, it must pay a success fee of 25 percent of the lawyer’s base salary. Many more details are available at Now Counsel Network.